60 Minutes will feature CAL FIRE Director Ken Pimlott reviewing the Camp Fire and explaining the complex challenges of how to mitigate these disasters in the future. These strategies include hardening housing structures to withstand ember storms, introducing fire back into the landscape through prescribed and managed fires, and applying the latest technologies to improve real-time situational awareness for better citizen notification, smarter evacuation, improved firefighter safety and effectiveness. This isn’t a simple problem but as a community we can come together to meet these complex challenges right now. 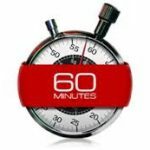 Watch the episode of 60 Minutes releasing December 2nd to learn more.